The corpus luteum is the last active stage of an ovarian follicle’s lifecycle. Without it, early pregnancy cannot be maintained. The corpus luteum doesn’t get enough credit for the important roles in plays in pregnancy and the menstrual cycle. Here’s what you should know. The corpus luteum forms from the empty follicle left behind after ovulation. Your ovary is made up of follicles, which are very tiny fluid-filled sacs, each containing an immature egg (or oocyte.) During the first couple weeks of your menstrual cycle, hormones regulated by the hypothalamus and released by the pituitary gland trigger a few of these follicles to grow and the egg inside the follicles to mature. Eventually, one follicle becomes the dominant follicle. This is where the egg that will be released at ovulation comes from. The egg bursts from the follicle, leaving behind an “empty shell” of cells. Those cells go through a transformation after the egg is released, collapsing back in on itself and changing the hormones they secrete. This collapsed follicle is what becomes the corpus luteum. The corpus luteum is actually a “temporary” gland structure. It secretes the hormones estrogen and progesterone, preparing the body for the possibility of conception. These are the hormones that help further build up the lining of the uterus (to form a nice “bed” for the egg to implant itself into) and help maintain that lining. If conception does not take place, the corpus luteum begins to break down. This leads to a drop in progesterone and estrogen, and this, in turn, triggers menstruation. The reproductive cycle starts over again. When the corpus luteum is no longer active, it turns into the corpus albicans. More on that below. The follicular phase: this is when a select number of follicles in the ovary mature until one releases an egg. The luteal phase: this is post-ovulation when the body prepares the womb to accept a fertilized egg or embryo. Just before ovulation, there is a surge in the hormone LH, or luteinizing hormone. This hormone is vital both for ovulation and what happens just after ovulation. Before ovulation, LH triggers the follicle and the developing egg inside to speed up growth and development. LH also triggers enzymes to begin breaking down the outer walls of the follicle. Eventually, finally, the egg reaches full maturity, and the follicle wall breaks open. This releases the mature egg in a process known as ovulation. Once the egg is released, LH continues to impact the cellular structure of the former follicle. Before ovulation, granulosa and theca cells in the follicle produce estrogen. However, after ovulation, LH triggers these cells to transform. They begin to release the hormone progesterone. Progesterone plays an important role in the luteal phase. Firstly, progesterone signals the pituitary and hypothalamus glands in the brain to slow down production of the hormones FSH, LH, and GnRH. This prevents additional follicles in the ovaries from developing and ovulating. Something else progesterone does is signal your breast tissue to prepare to produce milk. This is why your breasts can be tender after ovulation and before menstruation. What Happens to the Corpus Luteum If You Get Pregnant? Or If You Don’t? hCG signals the corpus luteum to continue secreting progesterone. The progesterone prevents the endometrium from being expelled and continues to prevent further ovulation. However, if pregnancy doesn’t occur, the corpus luteum slowly disintegrates. This happens about 10 to 12 days after ovulation, or two to three days before your period starts. As the corpus luteum breaks down, the cells in the corpus luteum stop producing as much progesterone. Eventually, the drop in progesterone leads the endometrium to break down. Menstruation begins. Also, the drop in progesterone signals the pituitary and hypothalamus glands to increase production of FSH, LH, and GnRH. This restarts your menstrual cycle, and the follicular phase starts anew. What Is the Corpus Albicans? When the corpus luteum breaks down, scar tissue is left behind. This scar tissue—which is made up of cartilage—is known as the corpus albicans. While the corpus luteum is yellow in color (corpus luteum means yellow body in Latin), the corpus albicans is white. Corpus albicans means white body in Latin. The corpus albicans remains on the ovary for a few months until it eventually breaks down. The corpus albicans doesn’t appear to serve a specific purpose. Unlikely the corpus luteum, a corpus albicans doesn’t act like a gland and doesn’t secrete hormones. Where happens to the corpus albicans? Immune cells known as macrophages act like an internal clean up crew and engulf most of the cells that once made up the corpus albicans. In very rare circumstances, the corpus albicans remains and scar tissue builds up around the ovary. Not much is understood about why this happens because it so rarely occurs. You may remember from above that the corpus luteum is formed from the broken open follicle that released an egg during ovulation. Sometimes, the opening of the corpus luteum seals back up. Fluid fills the cavity and forms a cyst. This kind of cyst is known as a functional cyst. They are usually benign (not cancerous) and go away on their own. If you’re going through fertility treatments, an ultrasound conducted at the beginning of your cycle may spot a corpus luteum cyst. Depending on the size of the cyst, your doctor may delay your treatment cycle or drain the cyst. If you tend to develop corpus luteum cysts, your fertility doctor may put you on birth control the cycle before treatment. 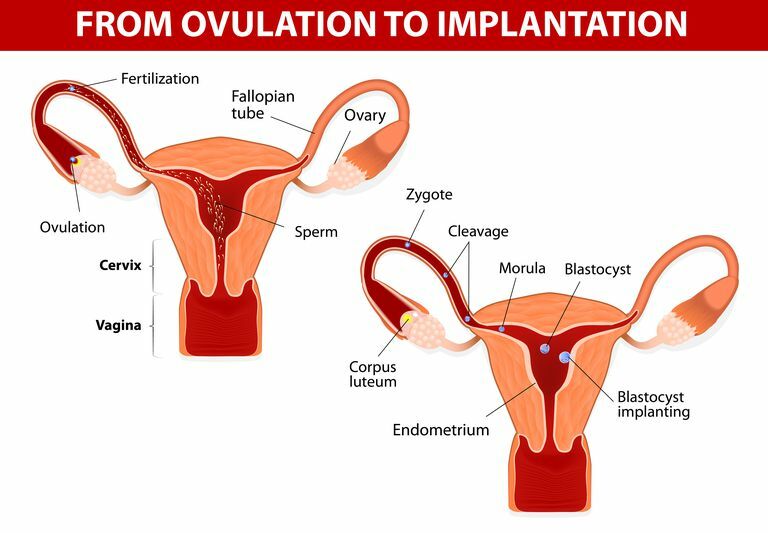 This would prevent ovulation in the month before treatment, which in turn would prevent the formation of corpus luteum and the potential for a cyst. Usually, corpus luteum cysts are painless and harmless. Some women find out they have one of these cysts during an early pregnancy ultrasound. In these cases, the cyst will usually resolve on its own by the second trimester of pregnancy. If your doctor sees the cyst is unusually large or growing, or it’s especially painful, your doctor may surgically drain or remove it. Sometimes, a corpus luteum cyst can cause mild discomfort. It may come as a sharp but quickly gone twinge of pain on one side. Other times it may cause a dull, more constant pain, also focused on one side of your pelvic area. If you get pregnant, this pain may persist longer during the early weeks of your pregnancy. If you don’t get pregnant, the pain will likely go away a few days after your period starts. As long as the pain is not severe and not accompanied by other worrisome symptoms (like vomiting or fever), there is probably nothing to worry about. Mention it to your doctor, but try not to worry about it too much. In rare cases, a corpus luteum cyst can cause severe pain. In very rare cases, if the cyst grows especially large, it can cause the ovary to twist. This may lead to ovarian torsion. Surgical intervention would be required. As always, if you’re experiencing severe pain or unusual bleeding, go to the nearest emergency room, or contact your doctor immediately. Ovarian torsion can be very serious. What Is a Corpus Luteum Deficiency or Defect? As you read above, the corpus luteum is responsible for producing the hormone progesterone. In some cases, the corpus luteum doesn’t produce enough progesterone. This can lead to abnormal spotting. Low levels of progesterone may lead to a “light period,” making you think you’re not pregnant when you really are. When the progesterone levels are low after ovulation, this may be called a corpus luteum defect. More commonly, it’s referred to as a luteal phase defect. A corpus luteum deficiency may increase your risk of early miscarriage. Treatment may include progesterone supplementation or the use of fertility drugs like Clomid or hCG injections. The theory is that boosting the hormones leading up to ovulation (with fertility drugs) will help produce a stronger corpus luteum. However, there's no current evidence that these treatments help. Also, hCG increases the risk of developing ovarian hyperstimulation syndrome (OHSS). Proper diagnosis of a corpus luteum defect is also controversial and unclear. Based on the current evidence, the American Society for Reproductive Medicine doesn't recognize luteal phase defect as a specific cause of infertility. Practice Committee of the American Society for Reproductive Medicine. Current clinical irrelevance of luteal phase deficiency: a committee opinion. Fertil Steril. 2015 Apr;103(4):e27-32. doi: 10.1016/j.fertnstert.2014.12.128. Epub 2015 Feb 11.